With the Reference On-Ear, Klipsch has accomplished the rare feat of incorporating deluxe comfort and style into the high-performance mix for a cool price. As far as headphone features are concerned, Bluetooth and gesture controls don't interest Klipsch a whole lot. Rather than putting its eggs into as many baskets as possible, the Indiana-based company chose the route less traveled with its Reference On-Ear headphones, opting instead to master of the fundamentals: performance and comfort. For headphones in 2015, $199 (about £177, AU$256) is certainly an approachable asking price. It's enough to grab several recommended headphones, but it's also enough to nab the Klipsch Reference On-Ear headphones, the most comfortable on-ear headphones I've ever worn. With a simplistic presentation consisting of brushed aluminum, leather and sturdy plastic, the Klipsch Reference On-Ear headphones relish in their minimalist design. Style and comfort cross paths at every angle on these cans, but the two succeed in not stepping on each other. Starting from the top, the headband on the Reference On-Ear gets the deluxe treatment, padded generously with foam and wrapped in leather. With a little pressure on each of its sides, the housing cradles for the adjustable sidearms can be felt through the padding. My head is fairly large, but the Reference On-Ear adjusted to my size for the perfect fit. Extending down from the headband are the sidearms. Mostly made up of plastic, each sidearm is coated with a layer of brushed aluminum on its exterior. Just above where the earpad makes its appearance, the sidearms feature a durable metal hinge. Executive in style as these cans may appear, they possess the sporty trait of folding up into a fairly compact form factor. The earpads connect to the sidearms with a mechanism that allows the pads to wiggle around, making optimal placement onto your ears for the best sound delivery a piece of cake. Aside from that, don't expect any other additional feats of bendiness here. The speaker housing unit is topped with slick, brushed aluminum branding and rocks a body made up of black, matte-textured plastic. A slim band of plastic accented with a silver sheen separates the plastic from the comfortable padded leather earpads. Giving the plush cushions a slight squeeze reveals the speakers hiding behind a grille. Finishing off the presentation is the attached 3.5mm cable. It's flat, so it won't tangle unless you tie a knot in it. This addition, insignificant as it might seem, is applauded. The inline controls offer play, pause, volume adjustment and song skipping functions. Included in the box is a fancy tote to carry the Reference On-Ear around in. While the understated design of the Klipsch Reference On-Ear can stand alone, once piggy-backed on top of its performance and comfort, we've got quite the contender here. I spend a lot of my time testing headphones right at my workstation and, to be the most productive, I prefer to be wearing headphones that can help me drown out a bit of the outside noise. The Reference On-Ear, while not packed with active noise cancellation, offer a snug seal around my ears that blocks a surprising amount of sound out while keeping my music from leaking out. The best perk of in-ear and over-ear headphones is that once they're on, you can forget about them. Unfortunately, that's usually not the case with on-ear headphones, as the earpads press against your head relentlessly. Klipsch has removed any cause for concern with the generous amount of padding included in the Reference On-Ear headphones. I have worn these headphones from daybreak to day's end without complaint. Gaming, working and commuting while listening pain-free is not something I can say of most on-ear headphones. Another reason that I could keep these on all day is because they push sound like a champ. The name "Reference" offers a hint toward the Klipsch's goal with these headphones. The word implies - as you may have guessed it - reference-quality audio. This means that these headphones strive to reproduce sound as it is meant to be heard: unbiased, without any extra effects, like bass or treble flares, added on. Regardless of whether you care for what this style of audio performance entails or you're just along for the ride, there's a lot to like here. Plenty of music examples showcase the capabilities of the Reference On-Ear: "Black Night" by The Dodos features a thumping drum track that sounds rich next to its crisp vocals. To round out the genre offering here, "Change In Speak" by De La Soul is delivered in full effect with stunning bass. Finding tracks that shine was simple, but it was difficult for me to land on one type of music that these headphones don't reproduce well. Simply put, the Klipsch Reference On-Ear headphones are a competent set regardless of your music preference. 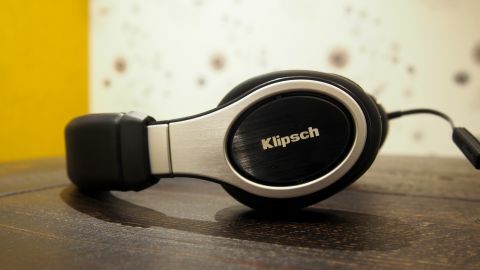 The Klipsch Reference On-Ear achieves quite the rare feat of being a comfortable set of on-ear headphones. Their full sound performance and build quality only sweeten the pot further. The individual functions of the inline controls can be a pain to feel for. Each side of the control module feels identical, making input errors all too common. That said, this is the only flaw about these headphones worth mentioning. Klipsch has delivered on making a set of on-ear headphones that are perfect for music lovers looking for true, unbiased sound reproduction of their music. Not to mention that this is the most comfortable pair of on-ear headphones I've worn yet. If you're looking for a more bass-heavy sound, the $269 (about £234, AU$338) Monster Inspiration Lite might be more of interest to you. The $199 (about £176, AU$256) Koss BT540i offers wireless connectivity for the same price as the Reference On-Ear, but I preferred the sound reproduction that Klipsch offers. While their design may not offer the most amount of flexibility, the awesome sound reproduction of the Klipsch Reference On-Ear make them one of the more versatile options for headphones and a fantastic value at that.